LinuxTag 2010 is around the corner. There will be openSUSE Rock ‘N’ Roll from June 9Â to 12 at theÂ BerlinÂ Fairgrounds! We just received word that our project got accepted for a booth and that we have 13 talks in the program of the free conference. The talks with openSUSE people involved range from SUSE Studio to HA for openVPN and spread from Wednesday to the very crowded Saturday. Here is a complete list. SUSE Studio – Easily create software appliances for the cloud and more – With James Tan. In this presentation, James will show how quick and easy it is to create, test, and deploy appliances using SUSE Studio. Libyui – Universal User Interface Development Library – With Katarina Machalkova. This talk will introduce libyui internals and guide the user from developing a very simple “Hello World” program to creating a complex application in one of the language bindings. This talk will introduce to Monodevelop and GTK#. You will see some demonstrations of the concepts of an IDE. This paper starts with a short overview of the involved Services (DRBD, Pacermaker, openVPN, LDAP) and shows the detailed dependencies and configuration options of those services to make the openVPN access a high availability service. This talk will give you an insight into the methods of development and maintenance of the openSUSE systems based on Ruby on Rails. How to store low frequency accessed files with lower power consumption and lower failure rate than RAID. This talk gives an overview about the world of open source movies and shows the different chances to finance such projects. This talk is to give an overview over KMS, it’s benefits and it’s implementation both from the kernel and from the user space point of view. In this talk, we will explain the successes and limitations of GNOME 2.x that lead to the decision to start the new 3.0 effort, and we will study the planning methods that are used to release GNOME 3.0 in a way as painless as possible — both for distributors and users. This talk briefly introduces the KIWI image system and shows how to create images based on openSUSE. From A like Artwork (we guess you already heard of Vincents ninjaesque GIMP techniques) to Z like ZYPP, the linux software management engine. If you always wanted to know how you contribute back to a distribution, this is your chance to learn how. After it is possible for users of software to easily escape the famous dependency hell with smart and user-friendly package managers this talk will show you how free and open source software developers can escape the next circle – The Free Software Distribution Hell. This talk presents WebYaST which is the Web interface for the YaST system management tool. We are currently working on a Booth setup which includes a showroom of the latest developments in our beloved distribution which will be around release candidate one (RC1) during that time and we plan to release and show the next generation Build Service. The booth will also feature hack sessions for contributors, or people who want to become one, lead by the openSUSE Boosters. In these up and close hack sessions, with a small number of participants, a Booster will teach you all about a way to contribute to openSUSE and/or open source in general. Topics include hacking your first plasmoid, rolling your first package in the build service, fixing your first openSUSE bug or building your first distribution with KIWI. So grab your laptop and make yourself ready to go to Berlin! 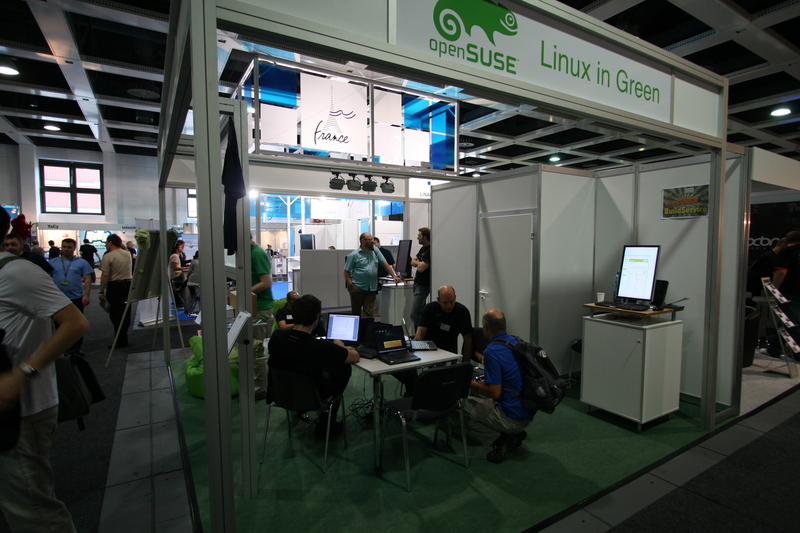 Oh and if you are interested in helping to plan or man our booth, have ideas for a hack-session we could do or in general want to get in touch with us about LinuxTag don’t miss the openSUSE Project Meetings every other Wednesday on IRC. Looking forward to see you there. Would it be possible to record the Talks and to upload them on the openSUSE TV channel?? ?